I’m obviously tired this morning. I wandered into the kitchen before dawn. I placed all my smoothie ingredients in a plastic cup and then stared at the red cup in confusion, like why are you not a smoothie yet? This is what happens when you get up before dawn to start your vacation. There is no better way to start a vacation than getting up before dawn to hit the road just as the sun is peaking over our mountain tops. It had been a few weeks and fall was approaching our mountains so fast, more and more leaves were turning auburns and golds every day. It was time to once again return to the aspens of the eastern sierras. This chutney right here would go with me. Perhaps I would spread it on some pork I roasted over the camp fire? Or perhaps I would be two freezing cold to make a proper breakfast in the eastern sierras in late September and I would spread this on cold bread with cashew butter and call that breakfast? Yes, when you wake up to ice frozen on the INSIDE of your car windows from condensation and its 20 degrees in the sun at 7AM that is the time for a super fast, high fiber and protein breakfast treat. Combine all in a sauce pan for five minutes until the mixture starts to thicken, turn the burner up to medium and let cook an additional five minutes. Let the chutney mixture cool for 10 minutes. Remove the cinnamon stick and blend all in a blender. This chutney is fantastic on toast with cashew butter or is very good with pork or lamb. Wow it sure sounds cold there. Burr! I love your recipe – sure if filled with health and sound delicious. I bet this would even taste good on oatmeal. Thanks for sharing on Real Food Friday. Pinned & tweeted! Yum! 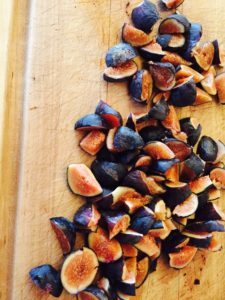 Thank you for sharing your healthy and delectable Fig Ginger Chutney at the Healthy, Happy, Green and Natural Party Blog Hop. I’m Pinning and sharing! 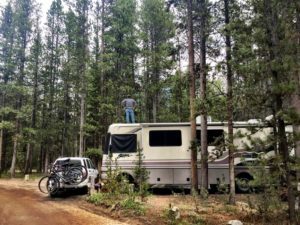 “There is no better way to start a vacation than getting up before dawn to hit the road just as the sun is peaking over our mountain tops.” Sounds beautiful! Your chutney sounds delicious. I like the idea of making it sweet, but not too sweet with the figs. Sounds like it would be great to enjoy with toast. Mmmmm.